Picture yourself out for lunch at Central Market; you just finished drinking your coffee. There is a recycling bin across the outdoor patio, or there is a trash can a few feet away: which do you choose? What if you found out that both bins led to the same destructive result? Thousands of tons of materials left curbside for recycling in American towns and cities are going to landfills. Americans recycle millions of tons of trash per year, trusting that the items that we toss in the blue bin go somewhere other than the landfill. While many hope that their recycling is getting re-purposed or turned into something new, the truth is a lot of it isn’t getting recycled at all. In the past, paper, plastic and other materials were sorted and then shipped abroad to China, where they would be processed. Over a third of the recyclables around the world get shipped abroad and China is the biggest importer. About 45 percent of the world’s plastic set for recycling has been exported to China since 1992. In 2018 China passed the National Sword policy, banning plastic waste from being imported for the protection of the environment and people’s health. China announced that it no longer wanted to import “foreign garbage.” While some waste managers who send recyclables to be processed domestically, or who ship to alternate countries continue to be successful, a majority of our country’s recycling supply is going directly to the landfill. We now have to ask the question how can we better negotiate among ourselves, among the world’s diverse peoples and cultures, so that we can resolve this issue and navigate toward a better future? Many local officials are not telling residents about the decline due to a fear that residents will give up on recycling altogether. While China has strictly banned 24 different materials, it also has demanded that the accepted materials (cardboard and metal) be only 0.5 percent impure. If you do not rinse the container or glass before recycling it, even a tiny amount of food or other trash can ruin a entire batch of recycling. Many waste companies say that the new contamination standards are impossible to meet, while others are attempting to clean up recycling streams by limiting accepted materials and educating people on what items can be recycled. Long before China’s recycling wall, plenty of “recyclables” ended up in landfills due to “single stream” recycling. Single-stream recycling is where residents are able to put everything in the same bin. This method is a switch designed to encourage more recycling; however, it results in more stuff that can not be recycled because it becomes “contaminated.” The Austin residential recycling department said that about 30 percent of plastic collected in these “single stream” bins can’t be recycled. Scrap plastic, previously exported to China netted $300 million in 2015, but now is only worth about $7.6 million. Alternate countries have stepped in to accept more plastics but exports are still down by 40 percent. Countries such as Malaysia, Thailand or Vietnam, have picked up some of what China is leaving behind; however, they do not waste management systems as well-developed as China’s. While China has been widely vilified as the cause of the recycling uproar, industry watchers say that the blame should not be placed solely on China. China has announced public-health concerns, environmental concerns, and an aspiration for independence, as reasons for its policy change. So, who then should be held accountable for this mess? It turns out we are all to blame. When you take recycling to the blue bin, whether it be at home or at your job or school, it is considered curbside recycling. Typically, curbside recycling is taken by a private company to a sorting plant where then the marketable goods are separated out. The goods found are then sold by companies or local governments to overseas processors. These private companies used to get paid by selling off these recyclable materials; now, it is as if they are being paid simply to have someone take it away. These stricter requirements are also an indication that recycling is more likely to be deemed “contaminated” if they contain materials that are not recyclable. This situation can be referred to as wishful recycling, where people set aside various items for recycling just because they hope they are recyclable even when they may not be. Most plastic bags, coffee cups, dirty takeout containers, Christmas lights and garden hoses are all not recyclable, yet many Americans toss their trash into the recycling bin without a second thought. By 2030 it is predicted that about 111 million metric tons of plastic waste will be displaced because of China’s new law. This amount is equal to nearly half of all plastic waste imported since 1988. There are expectations that this turn in the recycling industry will continue for months or years, but there is also optimism that the industry will eventually emerge better and stronger. Already, new recycling markets have emerged with the potential to perform the role that China once did. Recently, recycling has flooded into other Asian nations. In order to resolve this quickly escalating problem, Americans should take a few extra steps before depositing items in the blue bin. Rinse containers, glasses, and cartons before recycling them. This two-minute act can save a whole neighborhood’s worth of recycling from being contaminated and sent to the trash. We must act fast, as the amount of waste we create continues to expand. Check local guidelines to find out what can and what cannot be recycled. Get the peanut butter out of the jar, rise out your smoothie cup and never put plastic bags in the recycling. A sustained way of living is what society needs, and we can built one if we embrace beneficial changes to our everyday lives. It’s created by people’s minds and bodies when they’re in danger, or when something was not needed but done anyway unfairly. Though throughout a person’s life they may need some agitation in order to be successful, they do not need too much, as it’s definitely toxic, and causes nothing but trouble. For example, you’re more likely to experience a stroke(s), depression, heart attack, low self-esteem, a weakened immune system, when you are angry. Though many people experience these ailments throughout their lives, it can be much more commonplace throughout high school. With the mental-health presentation, a person(s) making threats on the school, and with finals and STAAR exams coming up, I feel that students should be aware of how being angry can negatively affect the lives of students. People are more likely to experience strain because of feeling underappreciated, or threatened, or just intimidated by all of the school/homework they have to do. It can be very demanding in this rapid transition to adulthood. Anger Repression(Keeping unhealthy aggravated feelings to yourself and hiding it). Having frequent “explosions” or strong, extended sessions of anger. Becoming violent easier and at a higher rate than those who don’t have anger issues throughout their lives. Having episodes of “Red-Vision”, meaning that people had gotten so angry that they saw red when almost primal anger took control of them. Making rash everyday decisions that they don’t think about beforehand. Fortunately, adults and students alike can treat their anger issues by talking with trusted friends and family, but there is also much you can do to help not just treat it but to also improve the lives of everyone around you. Some people need more encouragement than others, but in the long run, it will help them in many situations in their lives, and may even lower the risk of developing lifelong mental health issues that can affect them, such as anxiety, depression, I.E.D. 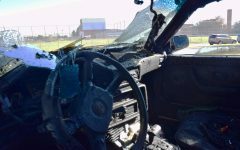 (Intermittent Explosive Disorder), ADHD, and others. Though it is perfectly normal to have periods like this that aren’t continuous; people get better as long as they seek help or care from a mental health professional, such as a psychiatrist. There are things you can do in order to calm down, though sometimes it may not be easy. Speak to someone you trust. Try writing. Share your thoughts and opinions, instead of keeping them pent up inside. This benefits many people, including you. Squeeze a ball, or go do something to get out your anger in a healthy manner, like jogging or a sport. Sometimes it is better to walk away before you have consequences to deal with. Read something you enjoy. This can help the anger recede, and you will be able to think clearly. Take a deep breath, count up to or down from 10, and/or take a few minutes to imagine going to a favorite place or doing a calming activity; this helps people put themselves in a calm state of mind. Listen to the person you may be angry at. If you’re upset about something or with someone else, talking to people and listening to their perspective—even if it is the person you’re angry with—may help you understand exactly what caused the problem, so you can fix it or figure out what you can do in the future to prevent the situation. I advocate every person who reads this to just take a step back, relax, count up-to or down from 10, and to ask themselves, “What am I mad about? How can this be helped?” Anger could be a major motivating factor in people’s lives, whereas to others, it is unneeded and could be removed. It can be hard to ask these questions in-the-moment, so I urge you to sit down with a close friend or counselor, and to take a good, long evaluation of your life, and to figure out what needs to be done to make life less of an angry mess to those who need it. Simply think about it, and use the tools and techniques of this article and others, in order to help keep the calm as you determine what the next best course of action may be. 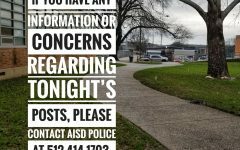 A couple of weeks ago, on Wednesday, Feb. 13, a manhunt ensued for the 18 year old McCallum student, who allegedly made terroristic threats to harm McCallum students and faculty. He was arrested by the Austin Police Department before school started that same morning, and many students went about their day completely unaware of what had transpired until news spread and an official email was sent out to parents parents that afternoon. Most of the drama seemed resolved, almost like it never really started, as the majority of the student body was only aware of the threat until after his arrest. Resolved, however, only until chaos spread Wednesday evening, while everyone was safe at home. Rumors regarding more threats spread through the means of shared screenshots, texts, and misinformation. The social media posts spread the story that one of the arrested student’s friends was going to shoot up the school that Thursday, on the anniversary of the Parkland shooting, and urged other kids not to go to school tomorrow. Many did just that, saying that they preferred not to take any chances, and Thursday’s attendance dropped sharply compared to the day before. In fact, many of us on the Shield staff chose not to come to school, to be safe, and not risk it. This particular incident was resolved, thankfully, without any actual violence, but the fear felt by the McCallum community has prompted a new empathy for the issue of gun control, as everyone has asked themselves, how would my life changed if something did actually happen? Our government has not made any significant, major restrictions or even adaptations to gun access laws. We have not seen widespread change. Though it is worth noting that many stricter gun laws have been passed at state level, there have still been no major advances. Nothing since Sandy Hook, since Las Vegas, since Parkland, or Santa Fe. And these shootings keep happening. Last week it seemed like it might happen again , and this time at McCallum. 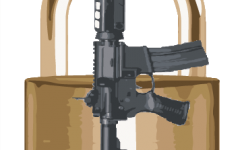 Our government needs to make it harder for citizens to obtain assault rifles, such as the AR-15 Wicks allegedly possessed. 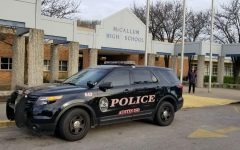 McCallum’s main hall was much emptier than normal on Feb. 14 after rumors were spread that a friend of the arrested student was going to shoot up the school. Photo by David Winter. There is only so much we as students can do to encourage the major changes we want to see, regardless of what those changes might be. We want stricter gun control laws. We’ve gone to protests, started conversations with the other side, checked to make sure our parents are voting. But we can’t say, for certain, that the changes we hope for will ever happen. That doesn’t mean that we should stop fighting or that we should lose hope. But it does mean that we might start to have to make adjustments to our reality as it currently is. Mass shootings have happened and continue to happen. Students don’t feel safe at school. Last week, most of us realized that we don’t know how to act when faced with a threat like that. It is awfully difficult to determine what threats are credible and what is not, especially on your own. We think many students would have felt more comfortable going to school if the McCallum administration had had more open communication and was honest with what we were facing the next day instead of a brief email that left readers with more questions than we began with. We recognize that the administration probably had their hands tied and were unable to disclose much of what was known, but having more specific information available to the public could have prevented much of the confusion and exaggerated messages that many saw on their social media. We also believe that community members should brush up on their news literacy; as we have seen, rumors can affect student’s mindset to the point where they will gladly take an unexcused absence over coming to school. If we become more comfortable with identifying credible, trustworthy information, it will be more difficult for opportunists to take advantage of a precarious situation. It would be impossible to fault everyone–or really, anyone– for the frenzy that filled many MAC families’ evenings that Wednesday. Would it have been better if social media had not gone wild with rumors and fears? The next day, maybe, but likely, at some point, we would have been faced with a similar situation, and these same questions and panic would have risen then. As a school, we should move forward and use what occurred to teach and motivate us to see how we can improve plans, emergency-preparedness and administration-to-family communication. Until my coach sent out a picture of Carson Smith, I didn’t know who he was. I had been trying to put a face to the name for a day, and this was the first time I actually realized who he was. So, I didn’t know Carson Smith, and I won’t claim to. He rowed at Texas Rowing Center with me, but, apart from sharing the same club, I didn’t know him. We had never interacted, I hadn’t ever even talked to him. Like most of Austin, I only knew about Carson after his passing on Jan. 27. Carson Smith was stabbed by two Murchison students (13 and 15 years old) on the night of Friday Jan. 25, and was rushed to the hospital soon after. He was kept on life support for two days, to ensure that his organs could be donated. On the night of Jan. 27, after friends and family had the opportunity to say goodbye, he was taken off life support. So, I won’t claim to know Carson and I won’t claim that my grief over his death was horrible. I was upset and horrified and stunned, but, again, I didn’t know him. A lot of my friends knew him personally, and they were suffering much more than I was. I cried, sure, and I was understandably upset, but compared to one of my friends who spent the entire weekend in his hospital room with his family, I was faring pretty well. However, I was still affected by it. Though I didn’t actually know him, we were in the same circles and knew the same people and shared the same space. This happened to someone close to me, someone who I did know about. This time, it wasn’t some random name or face on the news, it was someone who I actually recognized. Carson was only 18, one year older than me. He was in his senior year, and had been busy playing all kinds of sports and preparing to go to college the next year. He had been applying for college. He had written his college essays reflecting about the meaningful lessons he learned on his grandfather’s ranch. He had been planning for the future, expecting that he would have one going forward. He was legally an adult, one who could vote and join the military, but not one who could drink. He still spent summers with his huge extended family, playing hide and seek with his little cousins, or just picking them up and spinning them around the room. At the funeral, one of his little cousins started crying at the beginning, when they were showing pictures of him. I tried not to watch, trying to block out both the crying and the pictures, focusing on watching people entering the chapel, knowing that I would, no doubt, start crying if I looked at the pictures of a happy and hopeful teen, one who thought that he had his whole life ahead of him. His birth mother and her husband have two children. Carson was very close with the eldest one, a little girl he loved unconditionally, but the youngest one won’t remember his older brother. All he will have of Carson, of his brother, of someone who should’ve played a very important part in his life, are stories from his family. Carson had a huge family, and he loved it. He was adopted by a loving couple, Robin and Doug Smith, who weren’t able to have children themselves. His mother, who was going into medical school and didn’t have the resources to take care of a child, was very open to adoption, and was thankful that her child was going to a good family. It was an open adoption, and Carson was loved unconditionally by both families. He was very close with both of them, and loved spending time with all of his family. They remembered him as a funny and loving child, that family meant everything to. Both families thought of Carson as a gift, and will think of him fondly, even with the circumstances surrounding his passing. His parents didn’t speak at the funeral. His uncle did, along with the friend that put the Smith’s in contact with Carson’s birth mother. A representative for an organ donor association spoke as well, thanking Carson and his family for their generosity and kindness. Five of Carson’s organs (heart, lungs, liver and both kidneys) are now helping other people live their lives to the fullest. On the Monday after his death, our whole team, every junior who rowed at Texas Rowing Center, wore royal blue to commemorate his passing, and to show our support for his family in their time of grief. The blue, the brighter of our team’s colors, represented Carson’s sunny and upbeat personality. It was meaningful and emotional to come to practice that day and just see a sea of blue, to see the overwhelming support and respect that our team had. I was crying at the funeral. I was crying because his parents were outliving him. I was crying because his little brother wouldn’t remember him. I was crying because he was someone like me. It was the first time that it really hit me that Carson was a kid just like me. That it could’ve been me, that it could’ve been one of my friends, and that it really had been someone I knew this time. It seems like some people at McCallum, though troubled by a teens death, majorly dismissed his death, especially with the rumors surrounding his death. Somebody died, someone who easily could’ve been any of us. He was a happy, loving high-schooler, who cared about his family and sports, and was in the process of applying for college. He believed he was going to have a future, and it was brutally taken from him. I am not saying that anyone should do anything special. I’m just saying that we should try to think about what actually happened. A teenager was killed. Someone who was like us. And we should just think about that. On this day, I should be remembering the brave survivors of the tragic events that took place in Parkland, Fla., at Marjory Stoneman Douglas High School; instead, I will spend today worrying for my friends and teachers who decided to attend school despite the social media accounts of a second terrorist threat directed at the school. 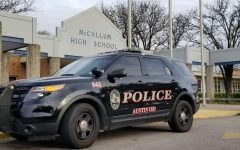 On Wednesday morning (Feb. 13, the day before the anniversary of the Parkland shooting), multiple written and verbal terroristic threats were directed at McCallum High School. The student who allegedly sent the threats was found and arrested. News of the threats and the identify of the student who made them was posted online by multiple local news outlets. 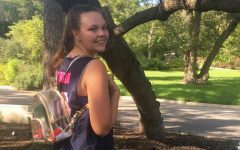 Just when it seemed like the incident had run its course, students began receiving and sharing news of additional threats that were allegedly been made by a friend of the student who was arrested. Social media platforms such as Snapchat and Instagram have provided a platform for students to share new information quickly, exponentially even. Unfortunately, because anyone can say just about anything on social media, I have trouble believing these posts. 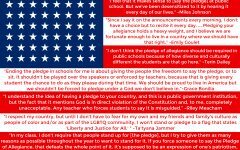 The fear radiating from these students posting these warnings, however, is reason enough for me to not attend school today, the one-year anniversary of the heartbreaking Parkland shooting that resulted in the death of 17 individuals, many of them high school students just like myself, looking forward to a future of college, careers and family. On Wednesday night, principal Mike Garrison issued a letter about the threats, which struck me as underwhelming. The message was emailed to all McCallum parents and faculty, guaranteeing safety at McCallum for the following day. I wish that the letter explained better how the authorities and the administration determined that the threats were not credible. After personally speaking with an Austin Police Department officer that evening, I was thoroughly confused about the credibility of the threats. Garrison’s letter gave the impression that the threats weren’t at all credible, and that they were only providing extra AISD police officers at McCallum on Feb. 14 out of an “abundance of caution.” However, when I spoke with the APD officer he said that police officers were still following all potential leads that they had for the case. Today, I did not attend school and encouraged others to not as well. I define an educational environment as a safe place where I can comfortably learn. My school has promised extra police security on campus there to protect me and my peers from multiple active shooter threats. While extra police enforcement may logically make me safer, emotionally, that still a very stressful environment to be in, especially with the student community feeling very left-in-the-dark about the status of the case. I would have felt a lot safe if I knew more about why the district had concluded that the threats weren’t enough to cancel school. I understand that AISD does not want to put fear in students by publicly saying anything alarming about the threats which could make the students avoid coming to school out of fear. 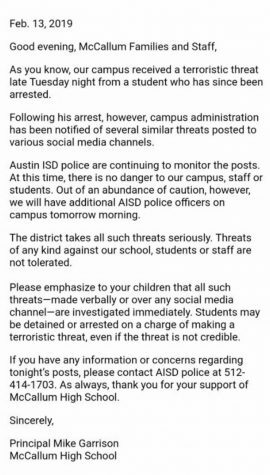 I understand that AISD cannot afford to cancel school every time a threat like this is made on social media, but I wonder, if it would have been worth the cost of one school’s attendance for one day worth the risk of any student or teacher’s life, regardless of the credibility? I decided that for me it was not. I decided to receive an unexcused absence because I refuse to attend a school day where I fear my own life because I can’t learn under those circumstances, making the risk to high to pay. This event has ramifications, however, beyond today. Today makes me wonder how we should determine whether or not to take a threat seriously enough to stay home from school in the future. How are we to ever to know for sure if a student is making a dishonest threat online as a hoax or making a genuine threat to our safety? I honestly don’t know the answer. On this anniversary I think back to the 14 students and three teachers who died at the hands of an armed student. I think back to the brave students who banded together, unafraid to confront those in power who seemed determined to keep them silent victims. 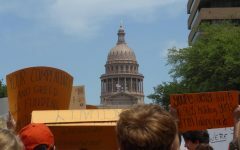 I particularly think back to the demonstrations we, the students of McCallum, held in solidarity and protest, marching to the state Capitol to demand that an event like that never happen again. And yet, it has. Shortly after Parkland, there was Santa Fe High School, hours away from us. And today, one year later, it seems like nothing has changed. Education is such an important factor when dealing with empty online threats. Students must be educated about how even a threat with no backing can be so harmful to their communities. If we are faced with empty threats every day, then how are we to ever identify devastating events before they happen. We have not made it any harder for those same teenagers to gain access to devastating weaponry. “Never again,” was the rallying cry of the movement. But the fact that we all are now contemplating how our reality would change in the event of a school shooting, it’s an all-too-depressing reminder that yes, it absolutely could happen again. As student journalists who are committed to reporting important truths that matter to our readers, it is of utmost importance that our school and district administration allow us to publish stories without prior review or censorship. This is why today as student publications all across the nation are participating in #StudentPressFreedomDay, we assert the essential importance of our freedom of speech and express how grateful we are to be at a school and in a district where we are able to report and write about what is going on around our school freely and without fear of our voices being silenced. There have been recent events elsewhere in Texas where that has not been the case. In 2015, Prosper High School principal John Burdett put into place a policy that student journalists there could not publish any story that put the school in a bad light or that was deemed controversial unless he approved it first. This edict caused an uproar in the journalism community, as the policy violated the basic foundation upon which journalism is practiced at any level. When the year started and the policy was still in place, it went so far as to the Student Press Law Center, a nonprofit advocacy group to step in and send a letter to the Prosper Independent School District threatening to take action if the policy wasn’t overturned. 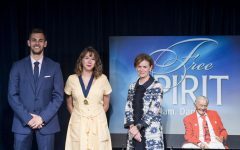 Fortunately, the policy was eventually rescinded, but not until the program had to change advisers, losing a distinguished adviser who had taught for decades with distinction, and the school administration faced a degree and scope of criticism that was much more intense than anything the original policy sought to prevent. In short, the whole ordeal was a hard road to travel, and one that highlights what can happen when people try to silence the voice of the media. Student journalism is vitally important to the functioning of a school because it informs everyone what is going on and when necessary calls into question what could be better. 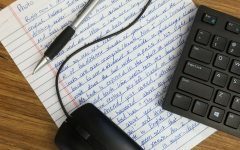 Well-informed populations are the backbone of what makes a good school good; the argument that American needs journalists has been made well and often in our recently troubled media times. What is essential for America as a whole is also essential for American schools. Students reporting issues freely and accurately is not only important but essential. Liberty and Justice for Some? Is Blend a help or a hassle? Walking back to your computer, expecting to see your essay neatly typed greeting you, you are instead met with the pure defeat of a blank slate. It’s a slap that has probably stung you at least once before, thanks to Blend. Whether it be finishing homework, submitting an assignment, voting for this year’s homecoming queen and king or, most recently, demonstrating that we paid attention to the schoolwide lesson vaping, we’ve all used Blend and have gotten accustomed to all its faults and advantages. Austin Independent School District began using Blend during 2017. Previously, AISD had been using Google Classroom for all its online needs. At first, there was definitely some confusion as to what exactly Blend would do and how it would improve education. 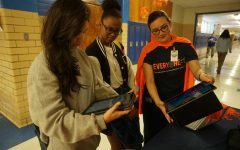 When the plans to switch to Blend were announced, AISD promised parents, and students that Blend would improve the teachers’ ability to understand students, enable the growth of the student by improving on their strengths and weaknesses, and provide opportunities for students to learn about digital citizenship. Now that a year and a half has run its course, many students have had the chance to form their opinions on this online tool. Is Blend helpful or a hassle? In order to find out, I interviewed several students about their usage, opinions and gripes about Blend. The results were mixed: some students thought it was an OK resource that improved the online component of school. One student who espoused this view was Trew Hoffman. Others, however, felt alienated by what they thought was a clunky, and non-intuitive interface. More students that I talked to agreed that the online tool helped them greatly in and out of school. Seeing as students had a very strong opinion on Blend, I decided to see if they had any suggestions to improve the online tool. The most common response? The user interface is too complicated. Overall, the opinions of students mean a lot when it comes to introducing new online programs. If the students don’t enjoy using it, it won’t work as intended. When it comes to Blend, there are a few issues, those mainly being the over-complication of navigating. But at the same time, it makes doing assignments and projects online a breeze. After searching for an answer to the central question, does it improve the lives of students and teachers alike? In the case of Blend, it seems like the answer is definitely yes. As class begins, no one’s really concerned about the 14-year-olds trying out their new mango pods in the science hall bathroom, but everyone knows about it. Whether you’ve walked into the familiar fruity scent, or seen the pack of freshman stumble out of the bathroom coughing, it’s no secret Juuling has found its way into our school. Vapes get used everywhere from bathrooms, to classrooms and even on buses. The reason why people choose to use them in these settings is because the vapes are so small that adults often don’t notice them. 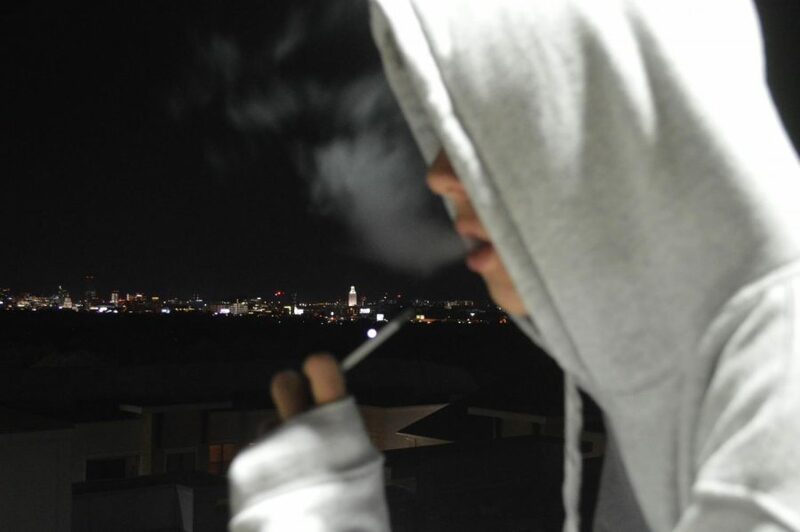 Vapes may not be visible to everyone, but everyone can certainly smell them. Even though vape fluid evaporates quite quickly the scent doesn’t usually go with it, unfortunately, both for everyone else in the room (or in some cases bus) and for the kids who gets caught by its characteristic smell. In addition, some schools, including Austin ISD schools, are beginning to crack down on vaping on campus. Along with the growing problem of vaping in schools, the punishments for doing it are growing as well. The San Francisco based company, Juul, was started by two Stanford alumni seeking smoking alternatives for adults. Originally created to wean adults from their smoking habits, it’s had the reverse effect on teens. With 59 mg/mL of nicotine in each pod, the brand has over 70 percent of the e-cigarette market. Most recently, the FDA has released a statement banning JUUL’s flavored pods as it appeals to teens, pushing them further towards addiction. The flavors stores have in stock now are all that’s left. The company is sticking to its mission of helping adult smokers, however, and is keeping mint, tobacco and menthol flavors in retail stores. We’ve all read about JUUL and the negative health effects it can have on its user in the articles written by the adults who didn’t have vaping around in their teen years. We’ve all heard about it from parents’ perspective. While still on the mission to cure adult smokers, the website is still up and students are still using it as a resource. Though teens may not see it, peer pressure plays a bigger part than they realize. Vaping is everywhere, no matter the event. Whether it be a high school party or the bathrooms at school. “Just being around people who do it gets the thought in your head to at least consider it,” one McCallum parent said. Though some students are immediately hooked, many begin as skeptics to the fad but become open to it through increased exposure. Watching others students use their JUULs and not seeing an immediate effect makes it easier for students to partake without looking at the cost. “Well, I honestly thought it was stupid. … I thought I’d never get into it myself but then I thought, what’s the harm?” a McCallum student said. Though vapes are 95 percent safer than cigarettes, it turns 30.7 percent of e-cig users into smokers. Juuls are regularly sold in smoke shops and gas stations everywhere. While the legal age of use is eighteen, students are said to get by with fake IDs,having their older friends buy for them, or even just hope that they don’t get carded. Students will go as far as ordering vape products from online stores as some sites don’t ID their buyers, then signing off on packages as their parents. Older students have even taken it upon themselves to sell to underclassmen. “I got my first Juul from my 18-year-old senior friend, but I’ve definitely heard of people upcharging underaged kids,” said one student who requested anonymity. Beginning with the initial charge of $40, the cost piles up. Some students vape up to a pack of four pods a day, averaging to a cost of $75 a week. While not everyone vaping does it this frequently, there’s no way around the dent the habit leave in your pocket. Many schools have tried to help students with an intervention like nicotine patches and gums and coping techniques for when they feel like they need to vape. These can help, but teens should be monitored because depression and other mental health disorders can develop when adolescents use nicotine. In essence, there’s a literal and personal cost to the lifestyle. Usually started as a joke, vaping is a legitimate concern that a large group of students have played some part in. Though it is a fairly recent fad, vaping’s effects will be felt for many years to come. The prevalence of vaping on campus has raised concerns that students are forming a habit without full awareness of the health risks and criminal liability that are incurring by vaping. If you missed it, the MAC caught on fire recently. Only the curtain ignited and ultimately, no one was injured. But this event did bring increased attention to fire safety procedures at McCallum. 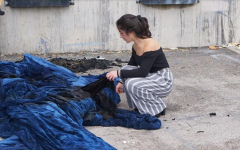 Though McCallum follows the laws for preparing for disasters of all kinds, that doesn’t mean the procedures have students ready to face an actual disaster. Not only do we not have enough tornado, hurricane and lockdown drills, but the drills we do have almost exclusively been held during first period. This year, we have had only one drill outside of first period (and it was during fifth period at essential the same time of day). This is dangerous and unsafe because it only prepares students for one class period and one part of the building, which could lead to chaos if we needed to evacuate during any other class. The monotony also leads to both students and teachers not taking these drills seriously. It’s not just a McCallum problem. Texas doesn’t have strict requirements for safety drills. The state only requires five drills: evacuation, lockout, lockdown, shelter and hold. Texas only specifies having fire drills once every month (with at least 10 days of school) and the other drills once per semester. Though Texas is rather lax with its safety procedures, it does have some guidelines for drills. One of these guidelines recommends that a school hold fire drills in many different periods. 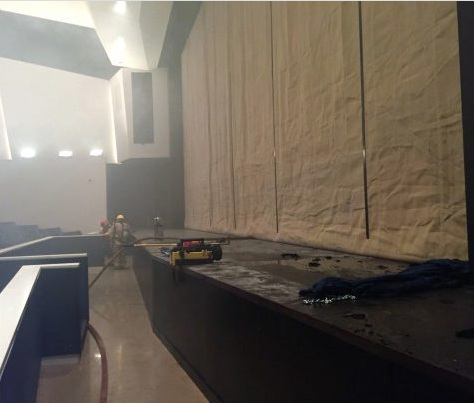 The MAC theater after the curtain caught fire reignited a second time on Tuesday, Oct. 23 and the fire department was called. Photo Courtesy of the Austin Fire Department. McCallum only holds drills (fire, tornado and lockdown, etc.) in first and occasionally fifth period. Though this is logical because those periods are 20 minutes longer due to student sharing, it has the unintended consequence of preparing students to evacuate from only two out of eight classrooms. We should occasionally hold drills at other times, which would help students familiarize themselves with different exit routes for evacuation and different areas of the school. Do the math: there is only a 12 percent chance (one eighth not considering lunch) that McCallum will catch fire in first period. In theory, yes; we are high schoolers, and we could probably figure out how to walk out of a building. But if the school actually did catch fire, we would not be calm or relaxed. The failure to practice different exit routes jeopardizes our safety. An actual evacuation of the school from an unpracticed route would not go smoothly. No one would know which exit to go through, as McCallum has many, many doors. Everyone would be running around, which could lead to dangerous outcomes. Another product of having fire drills exclusively during StIR time (almost always first) is that students and teachers don’t take the drills seriously. These drills have become so predictable and routine that nobody takes them seriously anymore. Though this feeling of calm is good during a fire drill and helps to get rid of nerves around danger, we are not actually being sufficiently prepared for a disaster. In a real fire, no one is going to be calm. These evacuations don’t even feel like a drill anymore, just something required and routine. Yes, routine is good, but again, the routine is only for first period. We need to take these drills seriously, as our lives potentially depend on them. If we changed when the fire drills happen instead of keeping them predictable, we could get used to being less complacent about emergency preparedness than we are now. The Texas Fire Marshal requires students to know how to get out of a building in the event of a disaster. Though all of us could probably figure out how to get out of the school, it wouldn’t be pretty. I cannot confidently say which exits I would take to get out of the math building, for example. So, technically, we are not in accordance with the Fire Marshal. All in all, we would probably be fine in a disaster. Keyword being probably. There is a potential threat, one that should be addressed. We are supposed to be safe in school, and if disaster struck, we would not be sufficiently prepared. McCallum’s safety procedures need to be improved if it truly wants to be a safe campus. Need a New Year’s resolution? Put your phone down. If you are serious about reducing your cellphone use as a New Year’s Resolution, then check out these resources. The Guardian: Break the Habit. Take Back Control. It’s the first thing you do in the morning – reach for your phone. Cell phones have become a vital part of our daily routine, and it’s easy to see how a simple invention has changed our lives. Students at McCallum are starting to see problematic overuse, in themselves and in their friends. Cell phone addiction can be defined as obsessive or compulsive use, comparable to substance abuse. Some common symptoms of smartphone addiction include losing track of time while on your cell phone, using your cellphone to hide from other problems, and feeling anxious without it. The problem is getting worse, too. According to data from Flurry Mobile, the average U.S. consumer spends 5 hours a day on their phones, 20% more than 2015. Teenagers are at a high risk to developing cell phone addiction, and according to a Common Sense Media poll, 50% of teens admit to cell phone addiction. “It’s a horrible cycle,” said sophomore Griffin Butler, “It’s not healthy.” Griffin described his a cycle of procrastination, where he uses his smartphone to cope, then feels guilty about wasting time and not being productive. This sentiment seems to be popular, and most students feel guilty for wasting time and decreased productivity, but find it hard to control themselves. “I think the people who are always on their phone will probably regret it later, and what? 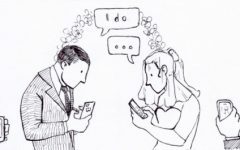 You’re just gonna spend your day on Instagram instead of with your friends?” said sophomore Scarlett Houser as she expressed her distaste for smartphone misuse. Can technology improve your workout? Our smartphones give us instant gratification, and can get us stuck in troubling loops. Apps like Instagram tend manipulate the user, and employ sneaky tactics like waiting to show “likes” until you rack up enough for a sufficient dopamine boost. Cell phones create an addictive response, so being without your usual fix can leave you feeling stressed, irritable, and panicked. Take the time to evaluate your smartphone use. Examine your behavior and look for compulsiveness or dependency. Buffum-Robbins and Houser advise to be self-aware, and to simply power your cell phone off. Other helpful tips include creating a “schedule” and removing notifications. While your smartphone may seem irresistible, be wary of the consequences. 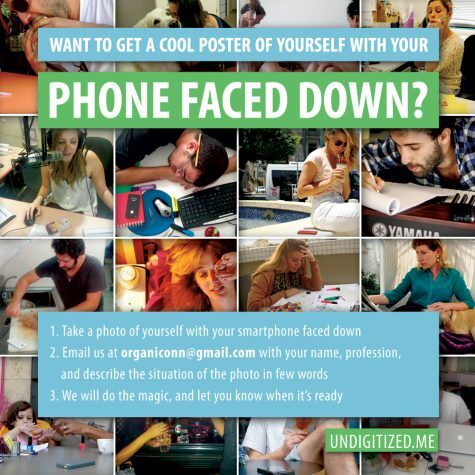 The UNDIGITIZE.ME was founded with three aims: (1) Raising awareness about the shortcomings of excessive smartphone use. (2) Encouraging app developers to design apps that are less addictive. 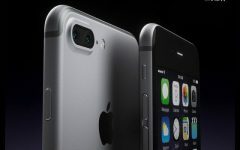 (3) Developing ways to cure smartphone addiction. The Phone Face Down project is a part of that initiative. Graphic from Undigitize.Me website. As most of us know all too well by now, the Austin Independent School District faces a budget crisis that prompted a district task force to discuss eliminating or retrenching expensive special programs such as our beloved Fine Arts Academy. While the Academy has been declared safe from cuts, there is still fear of other proposed cost-saving measures: teachers losing one of their planning periods, increasing class sizes, redrawing district boundaries or even consolidating or closing campuses altogether. Instead of blaming AISD money management or public school funding in general, we must focus on the real reason for this budget deficit. Usually high property values are a good thing for school districts because most school funding comes from property taxes. The reverse, however, is true in Texas. In an attempt to balance out school funding between richer and poorer school districts, the state legislature created the “recapture” program, commonly called the “Robin Hood Plan.” In theory, the system fairly distributes wealth more evenly across the state. 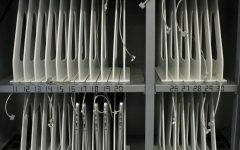 In practice, however, the system has over-corrected the issue, siphoning off a disproportionate amount of money from so-called “wealthy” districts to less property-wealthy school districts. The Robin Hood plan was never intended to be taken this far. On May 23, 1984, Edgewood ISD, just outside of San Antonio, reported that their district was struggling while their neighbor, San Antonio ISD, enjoyed vastly more funding. The issue went to court in a case called “Edgewood v Kirby,” where the court decided that the property tax method of funding schools was unconstitutional. It gave more money to rich, urban regions throughout the state, neglecting poorer rural schools. Created in 1991, the Robin Hood plan sought to ensure equal-opportunity school districts statewide by collecting money from property-rich regions and distributing it evenly across the state. The goal was to have a relatively even amount of money spent per student in each district. The results, however, have been anything but equal. According to data collected by NPR, the western half of the state, the one with fewer property-rich cities such as Austin, has a greater budget per capita, and the disparity is rising every year. In many cases, rural west Texas districts receive more than 33 percent of the national average. In Austin and other large cities, such as Dallas, Houston, and even Amarillo, however, the percentage is significantly lower than the national average. It can be argued that because these urban cities have such high populations, the cost of operating a school is lower per student than it would be in districts with a smaller student body. In large districts such as AISD, however, there are many schools to account for, each of them needing teachers, custodians, officers, counselors, and all of the expenses that go along with keeping a school running. In AISD alone, the same percentage of money made from property taxes is sent to the state in recapture funds as is used for teacher’s salaries (46 percent). The rest of the money (8 percent) is spent on professional services, supplies, and other operational costs. AISD estimates that in 2019 it will ante up $669.6 million to the state to be distributed to other districts. By 2020, there is an anticipated increase of another $115 million due to a reassessment of taxable property. In total, even since the beginning of the Robin Hood plan as we know it in 1994, Austin ISD has poured more than $3 billion into the program. This is not acceptable. That money could be used to fix up our old buildings, raise money for extracurricular activities or purchase new materials for teachers. There is no way that rural districts should have resources to spare while McCallum is having to make major cuts to our funding. Even though the Fine Arts Academy is no longer a possible budged casualty, major changes are still likely to happen affecting next year’s bell schedule, available classes and teacher schedules. Even though the effects of the Robin Hood plan have not been widely understood until the Fine Arts Academy closure scare, the plan’s impact had been evident in our longstanding facilities issues: leaky windows, broken air-conditioning systems, and pest infestations. It’s time for the way Texas regulates our budget to change. Abolishing the Robin Hood plan is likely out of the question, but it can and should be reeled in. If the state reduced how much AISD pays to other districts by 1 percent ($5.44 million) every year for the next couple of years, it could significantly reduce the disparity between rural and urban school funding. If we can find a balance between providing for property-wealthy districts and sending extra money to property-poor areas, the real intention of the Robin Hood Plan can be fulfilled.